Alpha is one of the year’s biggest and best surprises. It was a little eyebrow-raising to see Albert Hughes was directing a movie that could — at its most superficial level — be described as the story of the first time a man domesticated a dog. The gut reaction was to expect a prehistoric version of A Dog’s Purpose or Marley & Me. That’s territory far removed from the Hughes Brothers’ oeuvre, which includes Menace II Society and From Hell. Here, Albert’s directing solo and the result is a revelation that is quite possibly the year’s most visually striking movie. Yes. Visually, this one tops even Marvel. The images Hughes and cinematographer Martin Gschlacht (Lourdes) put on the screen are spectacular — and the 3D actually adds a little something to the experience, for a nice change of pace. Blissfully, the story has some meat to it, as well. While the story does indeed recount the first time a wolf was befriended by a human, there’s a whole other storyline involving a young hunter named Keda (Kodi Smit-McPhee, X-Men: Apocalypse) and his journey of survival. And there’s a bit of catch. It’s all subtitled. The entire cast delivers all of the dialogue in an unspecified language. That’s shooting for added realism. The story starts with a title card (in English) setting the time as 20,000 years ago. A tribe leader brings his son on a major hunting trip, hoping to convert him into a man. The trip turns tragic. Looking past that bit of awkward story flow is easy. Moving forward, the movie effectively recounts the relationship between the father, Tau (Johannes Haukur Johannesson, Atomic Blonde), and his son, Keda. Of course, Mom, Rho (Natassia Malthe, This Means War), is reluctant to see the boy go off on the hunt. He still thinks with his heart, not his spear. Turns our her fears were warranted. Keda is presumed dead after being hurled off a cliff by a wild bull. When Keda regains consciousness, precariously perched on a ledge and with a broken ankle, he quickly realizes he’s been abandoned. And therein his journey to manhood truly begins. 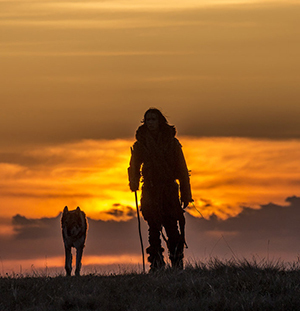 While trying to retrace his steps and make his way back home — before winter sets in — Keda encounters a wolf (the end credits “introduce” him as Chuck) and, through a set of circumstances, Keda quickly recognizes the wolf could be an ally in his fight for survival. They’re quite a pair. Both have been crippled and both are separated from their pack. As Keda cares for the wolf and cautiously builds a tenuous relationship with the furry companion, a number of firsts are checked off the list. There’s the first bowl of water. The first tug o’ war. The first fetch. The first face lick. The first cuddle. And there’s another that won’t be spoiled here. Enough about the firsts. Suffice it to say — happily — they’re not at all predictably staged. They happen by chance. They happen by sheer force of the circumstances. And they don’t come across as cheap and cutesy. Alpha is in some respects an arthouse feature trying to sneak its way into the mainstream; this elegantly-crafted adventure story certainly deserves a good home.